"What a lovely portrait of our epoch's greatest journalist." "Izzy Stone is an American phenomenon, and Andrew Patner's book about him is phenomenally good." "An extraordinary mind at work: That is what Andrew Patner shows us in this delightful book." "A literary 'My Dinner with Izzy.' The idea was to get the semiretired journalist to reflect on his career and subjects that matter to him . . . The mission was accomplished superbly." "A short book as rich as shelves of American history tomes, this lively conversational portrait of an ideally responsible citizen-journalist is enough to renew your faith in democracy, in humanity." "Stone talks well, sometimes brilliantly, and Patner is an excellent editor. The result is a small, delightful book." "Those of us of an age to remember I.F. 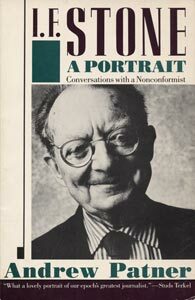 Stone's Weekly as a beacon of truth and sanity in what Stone called 'the haunted fifties' will relish Patner's delight in discovery of his subject's unique method of fact-finding and reporting." "An entirely engaging portrait . . ."
"[A] small gem . . . that captures the essence of Izzy in conversation . . . . My book would be most incomplete without Patner's work." "Andrew Patner, the young Chicago journalist who had the wit to debrief Izzy on tape . . . . ."
"[A]s one reads along, the charm of Stone's conversation steals into the heart." "A small book by Andrew Patner shows [Stone] to have been a conversationalist on the level of Saul Bellow's Von Humboldt Fleisher, with the same knack for mixing raffishness and erudition."